The annual appearance of the big yellow “Sweet Corn” signs on roadside farm stalls is always a moment tinged with sadness. When the corn is ready and the first crickets start to sound, you know it’s the beginning of the end of summer. The corn will be with us until the kids go back to school and then, like the season, it will lose a little bit of its glory as each day passes. “So sad,” L says every year when I mention this. Then she rubs her fingers together as if playing a tiny violin to accompany my sorrow. I think she’s mocking me. Maybe that’s what the crickets are doing as well. Next year I’ll just keep quiet. The first corn also reminds me of my son’s favourite summer meal when he was four or five. When asked what he wanted for dinner any time between mid-July and early September, he would almost always reply: “Corn on the cob and meat on the cob!” Corn and barbecued ribs have made regular appearances together on our table ever since. The corn we bought last weekend needed a bit of help. It wasn’t quite sweet; a few of the cobs were underdeveloped. Feta and mint, the star taste combination of the summer in our house (great with watermelon) came to the rescue. 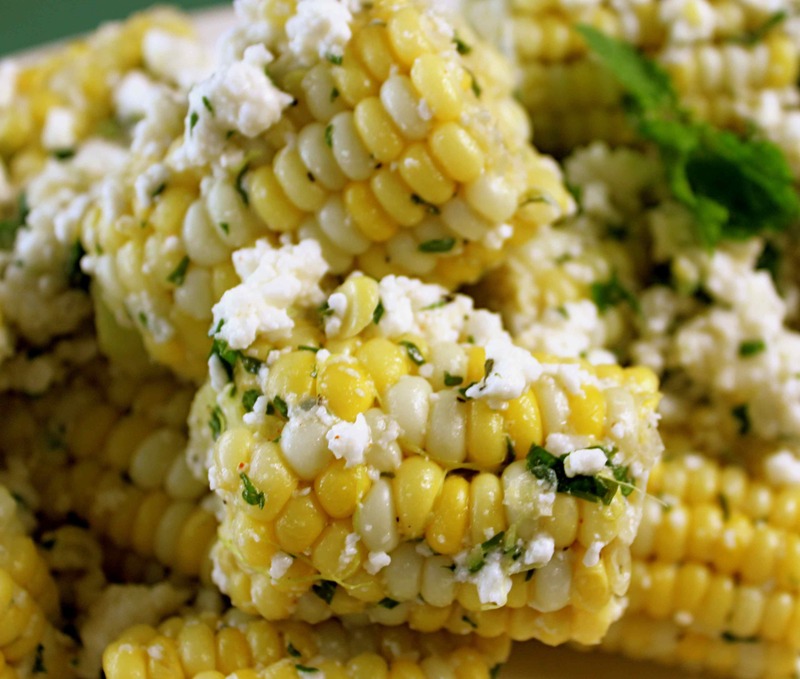 I mixed corn’s old ally, butter, with chopped mint, a little cayenne, some black pepper and lots of crumbled feta and tossed with cooked cobs. The butter added sweetness, the feta some savoury depth and saltiness and the mint made it taste just a little like summer may never end. Shuck and boil the corn in salted water for 3-4 minutes until tender. Meanwhile, mix the butter, mint, cayenne and black pepper into a paste and place in a large bowl. Cut the cooked corn into 3-4 inch pieces and toss with the butter/mint mixture until the butter is melted and the corn is well coated. Sprinkle with feta and toss again lightly. Serve immediately. This entry was posted in Sides, Vegetables. Bookmark the permalink.